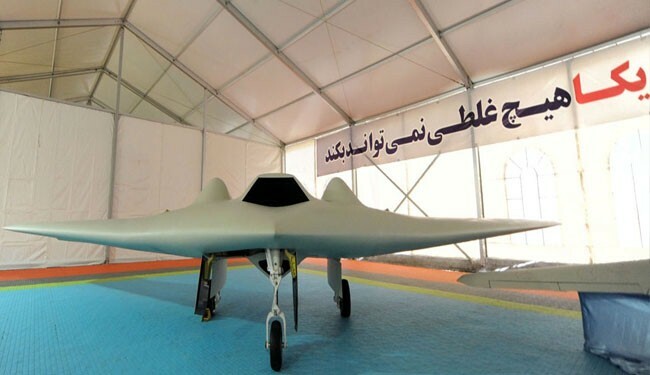 JNN 13 May 2014 Tehran : Iran has unveiled an indigenous version of a sophisticated American reconnaissance drone that it brought down and seized in 2011 while it was conducting a surveillance operation over Iranian airspace. This entry was posted in Asia Pacific and tagged Aerospace Force Central Command, Cloned Drone, iran, Iranian airspace, irgc, IRGC Aerospace Forces, Islamic Revolution Guards Corps, us, US Drone RQ 170. Bookmark the permalink. One has got to give credit where credit is due.Thank you US for all the sanctions and making life as difficult as possible for the Islamic Republic, for out of all these difficulties ,Iran became if not more progressive but on equal status to you in every respect.A blessing in disguise for Iran.